Rodrick Dixon will participate in Healing Tones from 03/27/19 through 03/30/19 (Philadelphia Orchestra). Rodrick Dixon possesses a tenor voice of extraordinary range and versatility that has earned him the respect and attention of leading conductors, orchestras, and opera companies throughout North America. Notable operatic engagements include: Los Angeles Opera in the title role of Zemlinky’s Der Zwerg conducted by James Conlon, and as Walther von der Vogelweide in Tannhauser, Michigan Opera Theater as Tonio in La Fille Du Regiment, Todi Music Festival as Lenski in Eugene Onegin and as Tonio, Portland Opera in the title role of Les Contes d’Hoffmann; Opera Columbus for the premiere of Vanqui (Prince); and the Virginia Opera as Sportin’ Life in Porgy & Bess, Cincinnati Opera as the Duke in Rigoletto, and Opera Southwest in the title role of Rossini’s Otello. On the concert stage, he is a regular guest of the Cincinnati May Festival, where he has performed Orff’s Carmina Burana, Stravinsky’s Oedipus Rex, Janacek’s Glagolitic Mass, Mahler’s DasKlagende Lied, Beethoven’s Symphony No. 9, Carmina Burana, Rachmaninoff’s The Bells, Rossini’s Stabat Mater and, this past season for Nathaniel Dett’s The Ordering of Moses in Cincinnati and in New York’s Carnegie Hall. Other notable appearances include: Philadelphia Orchestra for Der Zwerg and for the world premiere of Hannibal Lukumbe’s One Land, One River, One People, Los Angeles Philharmonic and at the Sydney Arts Festival in Australia in the title role of Stravinsky's Oedipus Rex conducted by Esa-Pekka Salonen and directed by Peter Sellars, Ravinia Festival for The Bells and Mahler’s Das Lied von der Erde, Cleveland Orchestra at the Blossom Music Center as Sportin’ Life in Robert Russell Bennett’s suite of music from Gershwin’s Porgy and Bess, Atlanta Symphony conducted by Robert Spano, Vail Music Festival as tenor soloist in Beethoven’s Ninth Symphony conducted by Marin Alsop, The Longfellow Chorus for a program of works by Samuel Coleridge-Taylor which was recorded and included in a film about the composer, and the Choral Arts Society of Music as the Celebrant in Bernstein’s Mass. 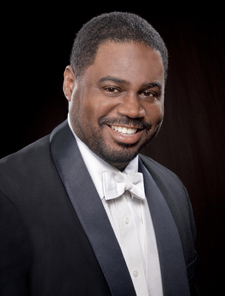 He returned to Carnegie Hall with the American Symphony Orchestra as tenor soloist in Delius’ A Mass of Life and to the Cincinnati May Festival as featured soloist in a new work by Alvin Singleton. He has also appeared with the Philadelphia Orchestra at the Saratoga Performing Arts Center as Tenor Soloist in a performance of Beethoven’s Symphony No. 9 and Hannibal Lukumbe’s One Land, One River, One People and with the St. Louis Symphony Orchestra Radio Italiana Torino as Erik in Der Fliegende Holländer. This season, he will return to Cincinnati Symphony for Beethoven’s Symphony No. 9 and to the Philadelphia Orchestra for a new work by Hannibal Lukumbe, and debut in Rio de Janiero, Brazil with performances of Too Hot to Handel. He has appeared in concert with the Atlanta Symphony, Hollywood Bowl, Cincinnati Symphony, Pittsburgh Symphony, Dayton Philharmonic, Colorado Symphony, West Virginia Symphony, Chicago Symphony Orchestra at Millennium Park; Elgin Symphony, Rackham Symphony Chorus and the Concordia Orchestra at Lincoln Center. A gifted recitalist, Mr. Dixon earned rave reviews for his Dame Myra Hess Memorial Concert broadcast honoring Roland Hayes on WFMT-FM/Chicago. He has also presented pre-concert recitals at the Cincinnati May Festival; completed a 30 city tour for Community Concerts and a duet concert “Following in the Footsteps” at Hampton University with Soprano Alfreda Burke, with whom he has also appeared in duet recitals for the Umbria Music Festival in Italy, Anchorage, Los Angeles, Washington D.C., Tennessee, Detroit, Toronto, Dayton and Chicago. His extensive television credits include PBS specials: The US Air Force 60th Anniversary Gala (2007), Cook, Dixon & Young Volume One (2005), Washington Opera Gala at Constitution Hall (2003), The Mark Twain Awards Honoring Whoopi Goldberg at Kennedy Center (2002), My Favorite Broadway: The Love Songs at City Center (2000). Other TV appearances include: The Tavis Smiley Show on PBS/NPR (2006), The Jerry Lewis Telethon (2002-2003), Marshall Fields’ Christmas Commercials (2002), TV One’s Christmas Specials (2006/07), WGN’s A Christmas Glory (2003 and 2006), The Tony Awards (1998), NBC’s Today Show, Good Morning America, The Rosie O’Donnell Show (2002) and The Wayne Brady Show. Rodrick Dixon’s musical theater credits include the original cast of Ragtime on Broadway, Show Boat at the Auditorium Theatre, Pops Concerts at Grant Park Music Festival, The Chicagoland Pops Orchestra at the Rosemont Theater and the Cincinnati Pops with Erich Kunzel, and Christmas concerts of Too Hot To Handel at the Detroit Opera House and at the Auditorium Theatre. Recordings include (Sony/BMG), PBS Great Performances Cook, Dixon & Young Volume One released in (2005), Follow That Star Christmas CD (2003), Liam Lawton’s Sacred Land (2006) and Rodrick Dixon Live in Concert (2008) and a Christmas album with the Cincinnati Pops.